-> Eric Arn (Primordial Undermind, Outer Vertex, the Xmas Party) lebt in Wien und spielt Gitarre. 1 guitar + no schnick-schnack. pure song singing style. -> Roy Culbertson III MAHTPA (Burlin Mud, Metal Mangs Orkaestra). Lawnmower Folk from Tempora, Illinois. 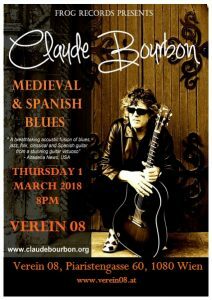 This French-born guitarist grew up in Switzerland where for a time he was classically trained, but he soon felt the need to explore the guitar without the limitations of written music and delved headlong into folk, blues, jazz and rock music. Now based in the UK, he has become a world-renowned player, highly acclaimed for his finger-picking style—plucking, picking and strumming at such speed that his fingers seem to appear just as a blur. This latest album utilises strains of folk, western, jazz and blues through such melodic delights as the traditional English Dance, the hypnotic Rodrigo and a gorgeous version of the Rolling Stones’ Angie. Claude also adds vocals to some tracks such as Rhyme or Reason and The End of the World displaying a slightly gruff, world-weary voice.